In 1902, Samuel S. Loeb and other business associates who had been with him in his Tacoma brewery, laid plans to open a brewery in Seattle. As detailed in his biography, the American born, Loeb, came to Seattle in 1902, three years after the closure of his Milwaukee Brewery - a branch brewery of the Pacific Brewing & Malting Co.
"Fierce Fire At South Seattle--Incendiaries Apply the Match to new Independent Brewery Plant--A $50,000 Fire This Morning--Establishment Just Ready for Operation." The arsonist was never caught, so it was never determined if the action was anti-Semitic. However, Loeb and his partners were the only Jewish brewers in the Pacific NW brewing industry. "Articles incorporating the Independent Brewing Company with a capital stock of $150,000 were filed yesterday afternoon at the office of the county auditor. The papers aresigned by Samuel S. Loeb, Herman Klaber, and Ben Moyses." Samuel Loeb served as president, and his brother-in-law, Albert Weinberg, was vice-president, with Benjamin Moyses serving as sec./treas. Their millionaire partner, Herman Klaper - "the Hop King" - left the company prematurely when he went down with the Titanic on her ill-fated, maiden voyage. The brewery was located at 4202 8th Ave. So., what is now Airport Way, and south of Seattle Brewing & Malting's Sweeney plant in Georgetown. The photo (above) was taken immediately after the plant was completed. As was common practice of the time, much artistic license was taken in depecting the brewery. Below are two drawings that show major improvements since the 1902 construction, however, it's difficult to tell what's fantasy and what's accurate. 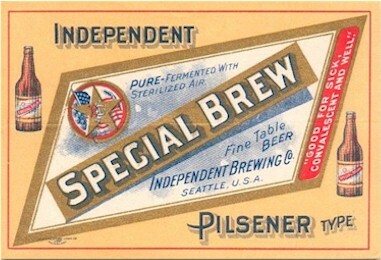 One of the brewery's products was a Pilsner style lager beer, as can be seen by the label below. This was a blatant copy of a label used by the Grace Bros. Brewing Co. of Santa Rosa. It didn't take legal action by Grace Bros. for Loeb to stop this obvious trademark infringement. Loeb dropped their Special Brew and came out with a Premier Pilsner, with their own graphics. This promotional, paneled glass would have been distributed about the same time, 1904 to 1905. In January 1906, Edward Sweeney’s holdings in Seattle Brewing & Malting was purchased by the Hemrich brothers, Andrew, Alvin, and Louis. They followed this with the acquisition of controlling interest in the nearby Independent Brewing Co., as well as the Claussen Brewing Assn. While Alvin Hemrich assumed the presidency of the firm, Samuel Loeb continued running his brewery as vice-president and general manager. 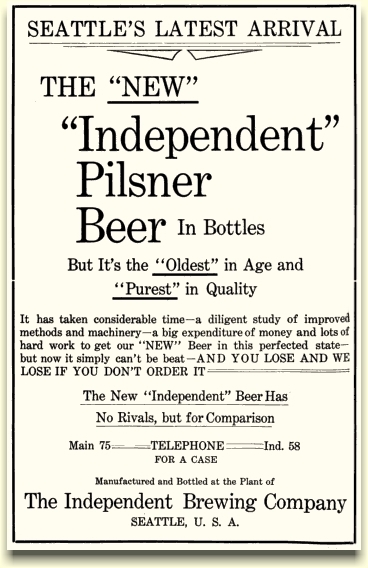 Also in 1906, they re-issued a new Independent Pilsner with a new label. The beer tray (below) was a stock tray, that had a center area free for a brewery's text and/or logo. This would have been more economical than commissioning a tray with original artwork designed specifically for their brewery. An example of this tray with logo is on the Black Hills Brewing Co. page. The tray depicted further below, showing a bottle of beer with the "brown label" is also a stock tray. All that was required by the tray manufacturer was to change the label graphics. They also used a stock tray, "Bertha" which was copyright in 1908. 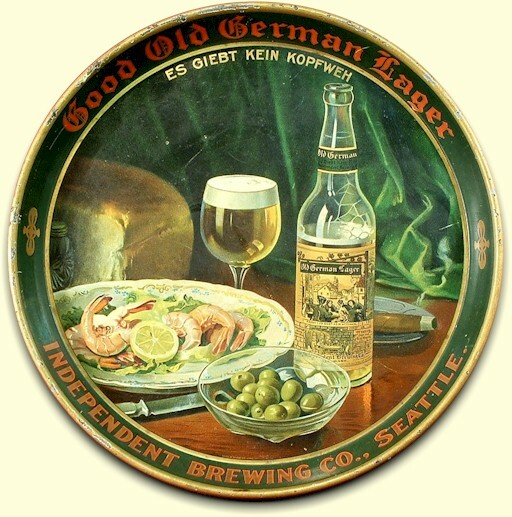 The Bellingham Bay Brewery also used this tray prior to 1910. An example of "Bertha" is shown on that history site. 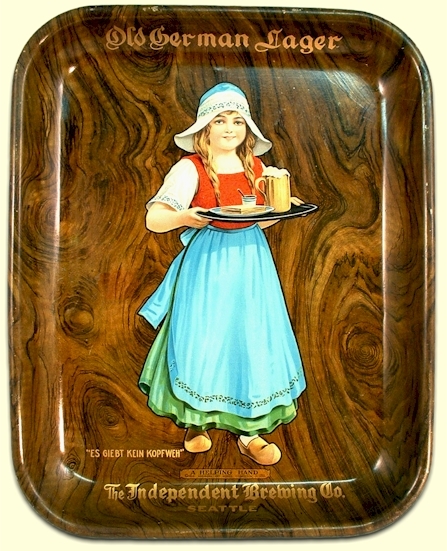 So, only four different trays are currently known that were issued by the Independent Brewery - including "A Helping Hand", shown further below. 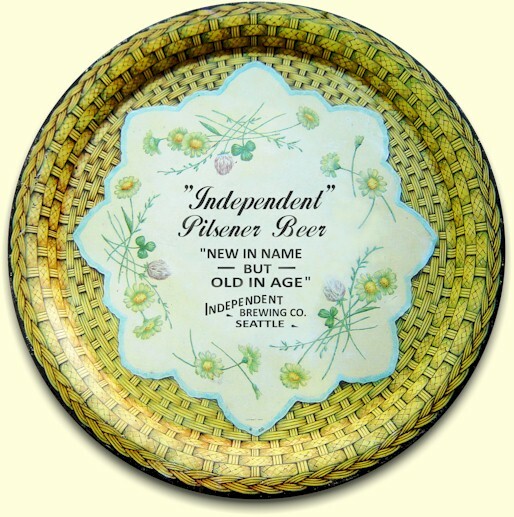 The brewery flourished in spite of the major competition from Seattle Brewing & Malting's Rainier Beer. In June of 1910 their brewmaster, J. Henry Beckman, introduced his Old German Lager calling it the "Fatherland Beer," with the slogan: "Prosit! Es Giebt Kein Kopeweh," which means - "Good Health! It won't give you a headache." The slogan was no doubt inspired by Pacific Brewing & Malting's use of the "anti-katzenjammer" beer tray depicting two cats, one of which has a headache and the other - who drank Pacific Beer - headache free! 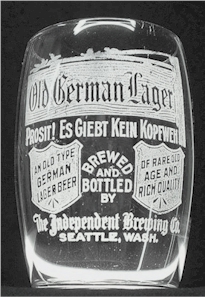 Headaches or not, Old German Lager was well received in Seattle and the surrounding areas, and became their "flagship brand." It even found favor with the beer drinkers of San Francisco and Portland. 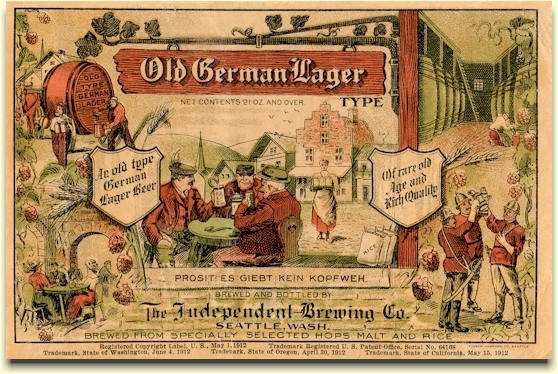 By 1912, Old German Lager was being bottled and distributed by the Chas. F. Wagner Co. in the Bay City, and in Portland by Rose City Importing Company. 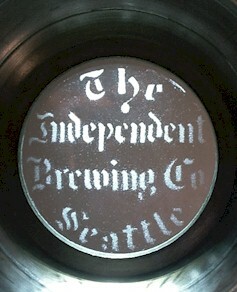 It's curious that the Portland glass (above) doesn't mention the Independent Brewing Co. The original bottle label shown below and on the tray, became a registered trademark in April, May and June of 1910 - in Oregon, California, and Washington, respectively. 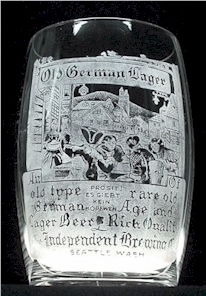 This label's graphics was also used on the etched glasses (top-left above). Both of these labels (below) measure 4¾" tall by 7½" wide and wrapped three-quarters around a 22 ounce bottle. 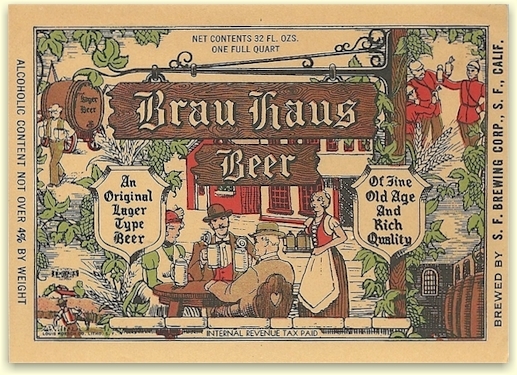 It appears that this 1910 label was copied from G. Heileman's Old Style Beer label, and Heileman was not ammused. They brought suit in November of 1911, for copyright infringement and were upheld. In May of 1912, Loeb's new label was introduced (below right) with brighter colors, different graphics, but identical verbiage. That label also suggests that bottles greater than 22 ounces may have been used. During this period approximately 70% of the output of breweries was given over to draft beer, which was dispensed in taverns. The remaining 30% was bottled for home consumption. 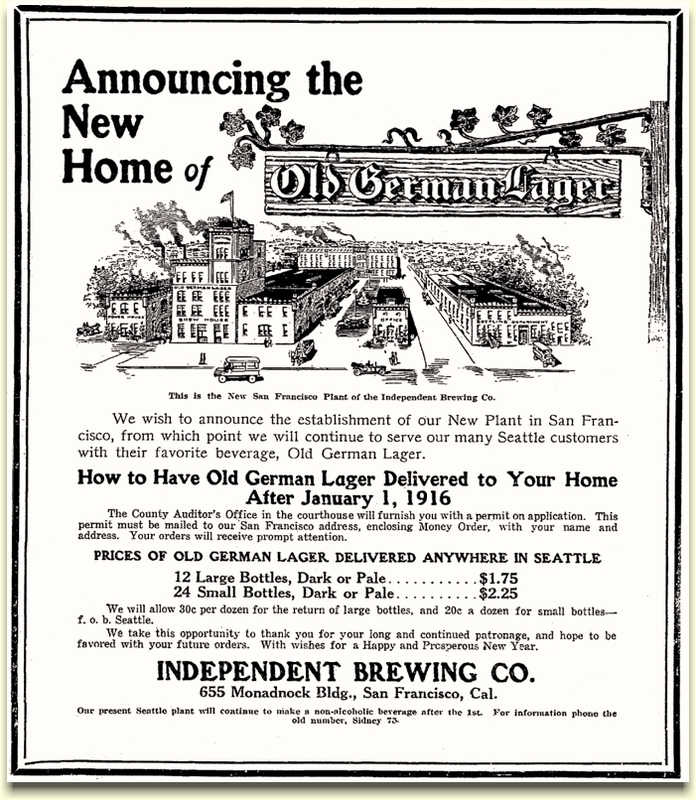 The San Francisco contract with Wagner remained in effect until January 1, 1916, when Loeb's Independent Brewery was closed by state-wide prohibition. Other Washington State brewing companies chose to move their operations to San Francisco rather than stay in business making soft drinks or near-beer. 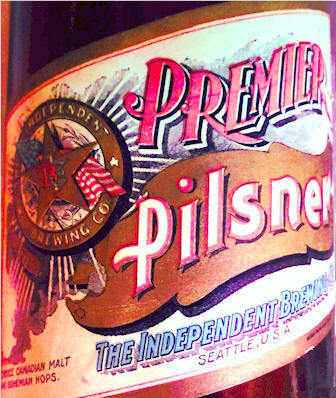 Independent's parent company, Seattle Brewing & Malting, as well as Tacoma's Pacific Brewing & Malting, chose to make the move to California believing that national prohibition would not be adopted. Loeb made the same choice, but rather than raise funds for the construction of a new brewery, he chose to contract for his beer and bottle it himself. In the last few days of December, 1915, just days before Wash. State prohibition took effect, Loeb ran the this ad in the Seattle Daily Times, showing his new plant and giving instructions on how to continue getting his beer. However, the plant depicted in the Dec. 1915 ad, and on his company's letterhead was not "...the New Home of Old German Lager." It was the plant of the Oakland Brewing & Malting Company, as can be seen on their letterhead below. "S. S. Loeb, of the Independent Brewing Co., Seattle, has opened offices in the Monadnock Building in San Francisco and has taken over the agency of their Old German Lager which was handled for a number of years by C. F. Wagner. Loeb was completing arrangements to buy entirely, or an interest in, the Oakland Brewing & Malting Co., when he was called home by the serious illness of his mother. Old German Lager will be brewed in the vicinity of San Francisco that much is definite and probably will be brewed by the Oakland Brewing & Malting Co., Carl Plaut, president." Loeb's use of the Oakland Brewery's image would suggest that he bought an interest in that company. Actually, Loeb & Moyese had taken part of the Oakland plant under lease, and sent their superintendent, Beckman, to Oakland to brew Old German Lager for them. Beckman would later assume full charge of the plant for the Oakland Brewing & Malting Co. Regardless of the Independent Brewing Company's Dec. 1915 announcement (above), the company did not continue with that name in San Francisco. No doubt the Independent Brewing & Malting Co. of Oakland objected. 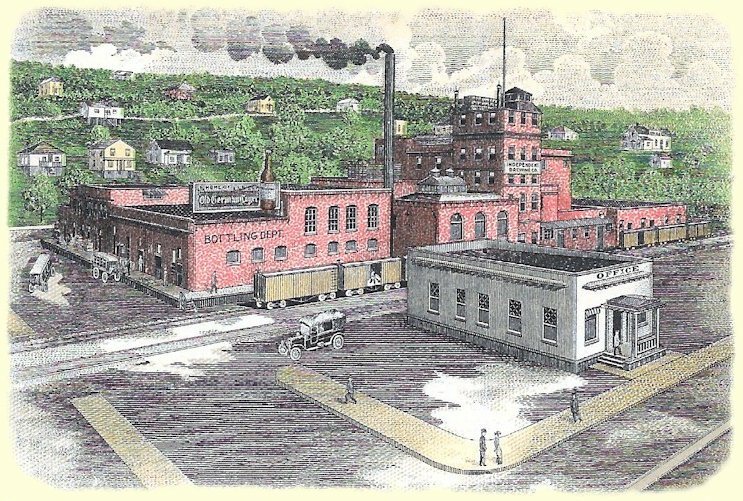 So Loeb chose to name the company after his flagship brand, and on April 1, 1916, contract brewing business was incorporated as the Old German Lager Brewing Co. Apparently his old California distributor, Wagner, felt the loss of the Old German Lager account, so he came out with his own Old German Lager brand. 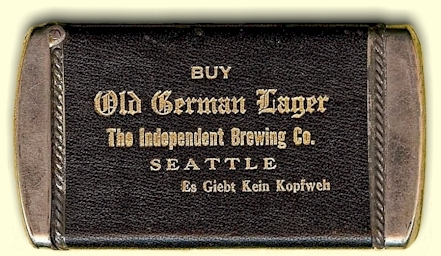 Loeb couldn't copyright the words "Old," "German," or "Lager," but he did have rights to the graphics and general appearance of the label. Consequently, he used the marketing slogan: "Demand the Brown Label." 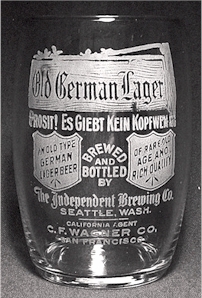 Despite Loeb's effort to protect his brand, Wagner contracted for beer from the Humbolt Brewing Co. of Eureka, which he bottled and marketed as "Wagner's Old German Lager Type Beer." He even used a similar brown-hued label. 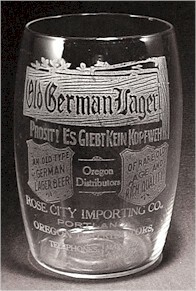 The Fresno Brewing Co. also used the same tactic with its look-alike, mono-chromatic, beige label for their "Old German Style Lager." It's ironic that what Loeb did to Heileman, others were now doing to him. The interjection of the word "type" or "style" appears to have been mandated by the patent office (which regulated the trade marks then) since earlier beer labels didn't use this terminology. This may have been to prevent confusion over imported German lager beers. By early 1918 the anti-German sentiment from the war in Europe forced Loeb to make a business decision. 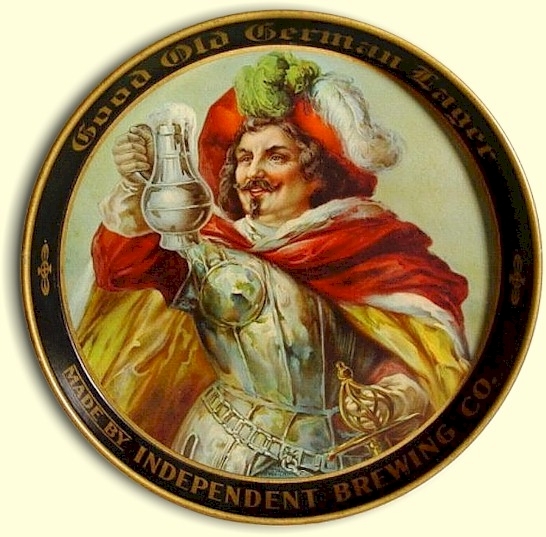 On the 21st of May he testified before Judge E. P. Morgan that San Franciscans have refused to buy "Old German Lager" because of its Teutonioc middle name. Consequently the judge authorized the corporation to change its name to Old Lager Brewing Company. 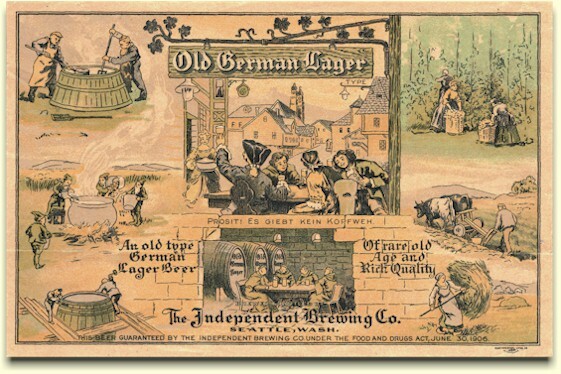 The brewery's brand was then changed to "Old Original Lager." The appearance of the bottle label remained the same but for the revised wording. 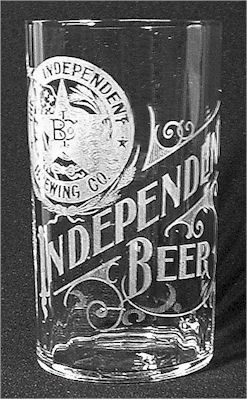 When national Prohibition took effect in January of 1920, many brewers attempted to keep their plants running by producing soft drinks and/or non-alcoholic cereal beverages called near-beer. In San Francisco, the Acme, Milwaukee, Rainier, and John Wieland breweries chose to keep their plants running with both product lines. Samuel chose to stay in business by selling only near-beer, now with the aid of his son, Sidney. The Oakland Brewing & Malting Co., who were producing their beer, chose to close rather than carry on making soft drinks or near-beer. So Loeb contracted with the Rainier Brewing Company for his non-alcoholic beer. However, demand wasn't great and the firm struggled. By 1924 the Old Original Lager Brewing Co. had closed, and Samuel Loeb retired to Los Angeles to become a real estate broker. April of 1933 saw the repeal of Prohibition and the return of beer production. While Loeb's contract brewing business was finished, the familiar beer label soon returned. In 1935, the San Francisco Brewing Corp. copied Loeb's 1912 label, making only subtle changes. To John Cartwright for images of the two cap lifters, and the match-safe. 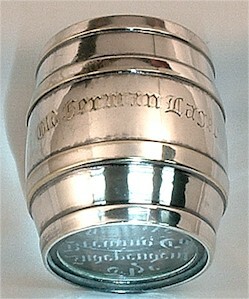 To Jeff Henry for the 1912 Old German Lager label. To Matthew Martin for the 1908 Labeled bottle. To Todd Gerhardt for the Premier Pilsner label. To Jeff Conradt for the page header and the drawing of the Brewery. 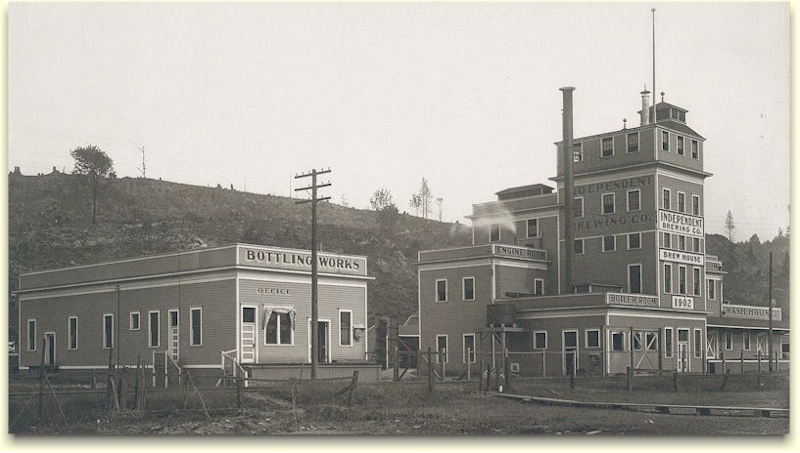 And a special thanks to the Boatman family for the 1902 photo of the Brewery.